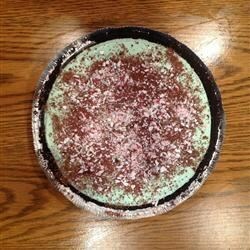 "This fluffy pie contains creme de menthe and creme de cacao." In a large saucepan combine evaporated milk and marshmallows. Stir over low heat until marshmallows are completely melted. Chill until mixture holds its shape when dropped from a spoon. Slowly pour creme de menthe and creme de cacao into marshmallow mixture while stirring constantly. Continue to stir until all ingredients are thoroughly combined. Pour whipping cream into a large chilled mixing bowl. Add a few drops of green food coloring if desired. Whip cream until stiff. Gently fold whipped cream into marshmallow mixture. Spread mixture into pie crust. Chill overnight before serving. Garnish each slice with shaved chocolate and crushed peppermint if desired. Be sure to refrigerate any leftovers. Rich, quick, and delicious, this amazing chocolate pie has it all. In my opinion there is too much liquer in the pie filling and it is overwhelming. I probably wouldn't make this again. Very nice. I froze mine instead of chilling it, and I added slightly less liqueur, just a personal preference. This is a foolproof recipe and a keeper. I fixed this recipe years ago and los it. I'm glad I could find it again.